The Green Belt is intended to check further growth of large built up areas (sprawl), to prevent neighbouring towns from merging into one another, and to preserve the special character of towns. Inside a Green Belt, approval should neither be given, except in very special circumstances, for the construction of new buildings, or for the change of use of existing buildings, nor for purposes other than agriculture, sport, cemeteries, institutions standing in extensive grounds, or other uses appropriate to a rural area. These are set out in the National Planning Policy Framework (Section 9 – paras 79 – 92). Green Belt exists to provide open space and to prevent urban sprawl: NPPF paragraph 79 states that: the fundamental aim of Green Belt policy is to prevent urban sprawl by keeping land permanently open; the essential characteristics of Green Belts are their openness and permanence. It is there neither to protect nor to enhance the landscape, although it may do that incidentally. London’s Green Belt is currently facing an unprecedented level of threat from development. See our commentary on why this is happening and why we feel urgent action is now needed to halt the further loss of London Green Belt Land. The main benefit of protected land relates to the purpose of the protection, that is to say – avoiding urban sprawl. Avoiding the costs of urban sprawl Urban sprawl has multiple economic costs, including increased travel costs; decreased economic vitality of urban centres; increased tax burdens due to more expensive road and utility construction and maintenance; increased car use leading to higher air pollution and increased health care costs for diseases like asthma, and loss of productive farmland and natural lands that support tourism. Two-thirds of all Green Belt land is in agricultural use; not surprising given its proximity to potential markets in the city. This is a vital economic resource for food security and soil protection. What are the additional benefits provided by our Green Belt? Eco-system benefits Different types of open land provide multiple eco-system benefits which include urban cooling, improved air quality, flood protection and carbon absorption (especially woodland areas), as well as local food production. Future proofing As London grows into a higher density city, so more people come to rely on protected green spaces for the many benefits they provide. Land protection policy recognises that these protected lands may be, and in fact stipulates that they should be, enhanced to provide more benefits in future. 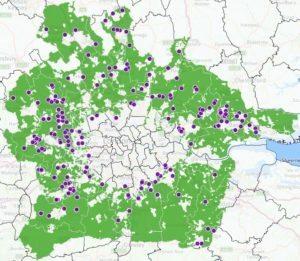 The London Green Belt Council believes that it is at times when cities grow that land protection policies are most critical. At these times ideally land protections should be strengthened rather than weakened or abandoned.